Diabetes Week is an annual UK-wide initiative devoted to raising awareness of diabetes and raising money to help fund research into the condition. Set up by British charity group Diabetes UK, this special week is now the annual focal point for all of the charity’s diabetes awareness, campaigning and fundraising activities. 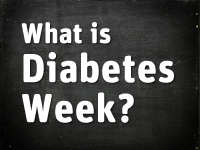 Diabetes Week takes place annually in the second week of June. This year it runs from 10 to 16 June. The theme is yet to be revealed. A nationwide event, it will see a massive range of community events, challenges, races and walks and much more. The week also often features an array of celebrities who take part in activities designed to influence fundraising. In 2018, we celebrated some of the many success stories in the diabetes community, including Graham Hogben, Tina Thorpe, Rachel Griffin, Michele Gladden and Mark Chadbourne. We have twice climbed to the top of Mount Snowdon in Wales as part of a charity fundraising mission to commemorate Diabetes Week. On our social media campaigns we have also promoted a number of campaigns including Faces of Diabetes and Blood Sugar Selfie. What is Diabetes.co.uk doing for Diabetes Week 2019? Hundreds of events and fundraising activities will be taking place across the UK to mark this year’s Diabetes Week, and this will include a contribution from the team at Diabetes.co.uk. Last year the theme was #LetsTalk, so we encouraged interaction on our social channels and the Diabetes Forum about opening up about how diabetes can make you feel. Stay tuned to our Facebook, Twitter pages as well as the Diabetes Forum to see us showing examples of how the DCUK community are supporting each other when it comes to diabetes, life... and everything else!